SUBHEAD: It is our duty to be informed and act to protect ourselves, our families and our communities. 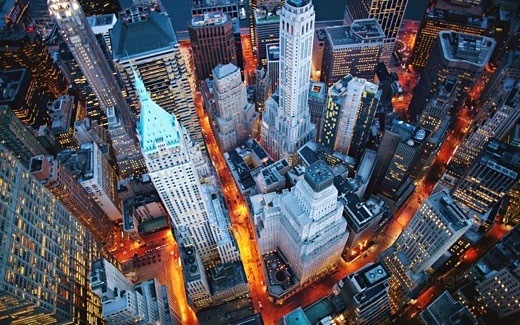 Image above: Aerial photo of downtown Manhattan financial district which is home to much of the bankster and financial scam operations of our "faked" economy. From (http://www.wallpaperup.com). This is Part 4 of a four part series entitled “Negative Interest Rates and the War on Cash”. QE takes away the liquidity preference choice out of the hands of the consumers, and puts it into the hands of central bankers, who through asset purchases push up asset prices even if it does so by explicitly devaluing the currency of price measurement; it also means that the failure of NIRP is — by definition — a failure of central banking, and if and when the central bank backstop of any (make that all) asset class — i.e., Q.E., is pulled away, that asset (make that all) will crash. We have been informed with reliable sources that in Germany where Maestro was a multi-national debit card service owned by MasterCard that was founded in 1992 is seriously under attack. Maestro cards are obtained from associate banks and can be linked to the card holder’s current account, or they can be prepaid cards. Already we find such cards are being cancelled and new debit cards are being issued. Why? The new cards cannot be used at an ATM outside of Germany to obtain cash. Any attempt to get cash can only be as an advance on a credit card….This is total insanity and we are losing absolutely everything that made society function. Once they eliminate CASH, they will have total control over who can buy or sell anything. The same confused, greedy and corrupt central authorities which have set up the global economy for a major bust through their dysfunctional use of existing powers, are now seeking far greater central control, in what would amount to the ultimate triumph of finance over people. They are now moving to tax what ever people have left over after paying taxes. It has been tried before. As previous historical bubbles began to collapse, central authorities attempted to increase their intrusiveness and control over the population, in order to force the inevitable losses as far down the financial foodchain as possible. Not even the death penalty was enough to enforce Diocletian’s price control edicts in the third century. Rome squeezed the peasants in its empire so hard, that many eventually abandoned their land, reckoning that they were better off with the barbarians. Such attempts at total financial control are exactly what one would expect at this point. A herd of financial middle men are used to being very well supported by the existing financial system, and as that system begins to break down, losing that raft of support is unacceptable. An oft-overlooked benefit of cash transactions is that there is no intermediary. One party pays the other party in mutually accepted currency and not a single middleman gets to wet his beak. In a cashless society there will be nothing stopping banks or other financial mediators from taking a small piece of every single transaction. ….So in order to save a financial system that is morally beyond the pale and stopped serving the basic needs of the real economy a long time ago, governments and central banks must do away with the last remaining thing that gives people a small semblance of privacy, anonymity, and personal freedom in their increasingly controlled and surveyed lives. The biggest tragedy of all is that the governments and banks’ strongest ally in their War on Cash is the general public itself. As long as people continue to abandon the use of cash, for the sake of a few minor gains in convenience, the war on cash is already won. Governments and corporations, even that genius app developer in Russia, have one thing in common: they want to know everything. Data is power. And money. As the Snowden debacle has shown, they’re getting there. Technologies for gathering information, then hoarding it, mining it, and using it are becoming phenomenally effective and cheap. But it’s not perfect. Video surveillance with facial-recognition isn’t everywhere just yet. Not everyone is using a smartphone. Not everyone posts the details of life on Facebook. Some recalcitrant people still pay with cash. To the greatest consternation of governments and corporations, stuff still happens that isn’t captured and stored in digital format…. ….But the killer technology isn’t the elimination of cash. It’s the combination of payment data and the information stream that cellphones, particularly smartphones, deliver. Now everything is tracked neatly by a single device that transmits that data on a constant basis to a number of companies, including that genius app developer in Russia — rather than having that information spread over various banks, credit card companies, etc. who don’t always eagerly surrender that data. Eventually, it might even eliminate the need for data brokers. At that point, a single device knows practically everything. And from there, it’s one simple step to transfer part or all of this data to any government’s data base. Opinions are divided over whom to distrust more: governments or corporations. But one thing we know: mobile payments and the elimination of cash….will also make life a lot easier for governments and corporations in their quest for the perfect surveillance society. An important reason why the state would like to see a cashless society is that it would make it easier to seize our wealth electronically. It would be a modern-day version of FDR’s confiscation of privately-held gold in the 1930s. The state will make more and more use of “threats of terrorism” to seize financial assets. It is already talking about expanding the definition of “terrorist threat” to include critics of government like myself. The American state already confiscates financial assets under the protection of various guises such as the PATRIOT Act. I first realized this years ago when I paid for a new car with a personal check that bounced. The car dealer informed me that the IRS had, without my knowledge, taken 20 percent of the funds that I had transferred from a mutual fund to my bank account in order to buy the car. The IRS told me that it was doing this to deter terrorism, and that I could count it toward next year’s tax bill. If all money becomes digital, it would be much easier for the government to manipulate our accounts. Indeed, numerous high-level NSA whistleblowers say that NSA spying is about crushing dissent and blackmailing opponents. not stopping terrorism. This may sound over-the-top. but remember, the government sometimes labels its critics as “terrorists”. If the government claims the power to indefinitely detain — or even assassinate — American citizens at the whim of the executive, don’t you think that government people would be willing to shut down, or withdraw a stiff “penalty” from a dissenter’s bank account? If society becomes cashless, dissenters can’t hide cash. All of their financial holdings would be vulnerable to an attack by the government. This would be the ultimate form of control. Because — without access to money — people couldn’t resist, couldn’t hide and couldn’t escape. By far the biggest risk posed by digital alternatives to cash such as mobile money is the potential for massive concentration of financial power and the abuses and conflicts of interest that would almost certainly ensue. Naturally it goes without saying that most of the institutions that will rule the digital money space will be the very same institutions….that have already broken pretty much every rule in the financial service rule book. ….We are, it seems, descending into a world where new technologies threaten to put absolute power well within the grasp of a select group of individuals and organizations — individuals and organizations that have through their repeated actions betrayed just about every possible notion of mutual trust. Governments do not trust their citizens (‘potential terrorists’) either, hence the perceived need to monitor and limit the scope of their decisions and actions. The powers-that-be know how angry people are going to be when they realise the scale of their impending dispossession, and are acting in such a way as to (try to) limit the power of the anger that will be focused against them. It is not going to work. The 14th Century was a time of turmoil, diminished expectations, loss of confidence in institutions, and feelings of helplessness at forces beyond human control. Historian Barbara Tuchman entitled her book on this period A Distant Mirror because many of our modern problems had counterparts in the 14th Century. Six hundred and fifty years ago came the climax of the worst financial collapse in history to date. The 1930’s Great Depression was a mild and brief episode, compared to the bank crash of the 1340’s, which decimated the human population. The crash, which peaked in A.C.E. 1345 when the world’s biggest banks went under, “led” by the Bardi and Peruzzi companies of Florence, Italy, was more than a bank crash — it was a financial disintegration….a blowup of all major banks and markets in Europe, in which, chroniclers reported, “all credit vanished together,” most trade and exchange stopped, and a catastrophic drop of the world’s population by famine and disease loomed. The parallels between the medieval credit crunch and our current predicament are considerable. In both cases the money supply increased in response to the expansionist pressure of unbridled optimism. In both cases the expansion proceeded to the point where a substantial overhang of credit had been created — a quantity sufficient to generate systemic risk that was not recognized at the time. In the fourteenth century, that risk was realized, as it will be again in the 21st century. What we are experiencing now is simply the same dynamic, but turbo-charged by the availability of energy and technology that have driven our long period of socioeconomic expansion and ever-increasing complexity. Just as in the 14th century, the cracks in the system have been visible for many years, but generally ignored. The coming credit implosion may appear to come from nowhere when it hits, but has long been foreshadowed if one knew what to look for. Watching more and more people seeking escape routes from a doomed financial system, and the powers-that-be fighting back by closing those escape routes, all within a social matrix of collapsing trust, one cannot deny that history is about to repeat itself yet again, only on a larger scale this time. The bust which follows the last attempt to kick the can further down the road will see the vast majority of society dispossessed of what they thought they owned, their ephemeral electronic claims to underlying real wealth extinguished. The advent of negative interest rates indicates that the endgame for the global economy is underway. In places at the peak of the bubble, negative rates drive further asset bubbles and create ever greater vulnerability to the inevitable interest rate spike and asset price collapse to come. In Japan, at the other end of the debt deflation cycle, negative rates force people into ever more cash hoarding. Neither one of these outcomes is going to lead to recovery. Both indicate economies at breaking point. We cannot assume that current financial, economic and social structures will continue in their present form, and we need to prepare for a period of acute upheaval. Using cash wherever possible, rather than succumbing to the convenience of electronic payments, becomes an almost revolutionary act. So other forms of radical decentralization, which amount to opting out as much as possible from the path the powers-that-be would have us follow. It is likely to become increasingly difficult to defend our freedom and independence, but if enough people stand their ground, establishing full totalitarian control should not be possible. To some extent, the way the war on cash plays out will depend on the timing of the coming financial implosion. The elimination of cash would take time, and only in some countries has there been enough progress away from cash that eliminating it would be at all realistic. If only a few countries tried to do so, people in those countries would be likely to use foreign currency that was still legal tender. Cash elimination would really only work if it it were very broadly applied in enough major economies, and if a financial accident could be postponed for a few more years. As neither of these conditions is likely to be fulfilled, a cash ban is unlikely to viable. Governments and central banks would very much like to frighten people away from cash, but that only underlines its value under the current circumstances. Cash is king in a deflation. The powers-that-be know that, and would like the available cash to end up concentrated in their own hands rather than spread out to act as seed capital for a bottom-up recovery. Holding on to cash under one’s own control is still going to be a very important option for maintaining freedom of action in an uncertain future. The alternative would be to turn to hard goods (land, tools etc) from the beginning, but where there is a great deal of temporal and spatial uncertainty, this amounts to making all one’s choices up front, and choices based on incomplete information could easily turn out to be wrong. Making such choices up front is also expensive, as prices are currently high. Of course having some hard goods is also advisable, particularly if they allow one to have some control over the essentials of one’s own existence. It is the balance between hard goods and maintaining capital as liquidity (cash) that is important. Where that balance lies depends very much on individual circumstances, and on location. For instance, in the European Union, where currency reissue is a very real threat in a reasonably short timeframe, opting for goods rather than cash makes more sense, unless one holds foreign currency such as Swiss francs. If one must hold euros, it would probably be advisable to hold German ones (serial numbers begin with X). US dollars are likely to hold their value for longer than most other currencies, given the dollar’s role as the global reserve currency. Reports of its demise are premature, to put it mildly. As financial crisis picks up momentum, a flight to safety into the reserve currency is likely to pick up speed, raising the value of the dollar against other currencies. In addition, demand for dollars will increase as debtors seek to pay down dollar-denominated debt. While all fiat currencies are ultimately vulnerable in the beggar-thy-neighbour currency wars to come, the US dollar should hold value for longer than most. Holding cash on the sidelines while prices fall is a good strategy, so long as one does not wait too long. The risks to holding and using cash are likely to grow over time, so it is best viewed as a short term strategy to ride out the deflationary period, where the value of credit instruments is collapsing. The purchasing power of cash will rise during this time, and previously unforeseen opportunities are likely to arise. Ordinary people need to retain as much of their freedom of action as possible, in order for society to function through a period of economic seizure. In general, the best strategy is to hold cash until the point where the individual in question can afford to purchase the goods they require to provide for their own needs without taking on debt to do so. Avoiding taking on debt is extremely important, as financially encumbered assets would be subject to repossession in the event of failure to meet debt obligations. One must bear in mind, however, that after price falls, some goods may cease to be available at any price, so some essentials may need to be purchased at today’s higher prices in order to guarantee supply. Capital preservation is an individual responsibility, and during times of deflation, capital must be preserved as liquidity. We cannot expect either governments or private institutions to protect our interests, as both have been obviously undermining the interests of ordinary people in favor of their own for a very long time. Indeed they seem to feel secure enough of their own consolidated control that they do not even bother to try to hide the fact any longer. It is our duty to inform ourselves and act to protect ourselves, our families and our communities. If we do not, no one else will.